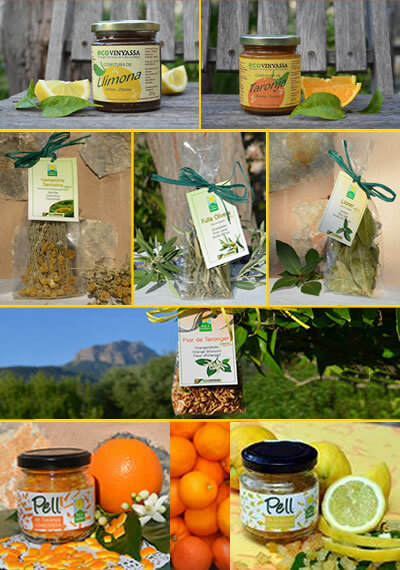 Enjoy in very best biology quality the fruity jams, select herbs as well as oranges / lemon peels and blossoms! Of course - freely from artificial preservatives and colorings. Spoil yourselves with dry herbs of the ECOVINYASSA - a special quality his equals looks. The sheets and blossoms are a hand-picked and are dried there in the aerial half-shade carefully. The biology-orange blossom – also "Azahar" called, is very much respectedly in the culinary one as well as in the therapeutic area. She works reassuringly on the nervous system and promotes a restful sleep. One uses them, primarily, for the tea infusion, fortified with some cinnamon or honey – a very aromatic, pleasant drink. The finely hacked and preserved peel of bio-oranges or bio-lemons from the solar valley of Sóller/Majorca taste on account of the high salary in ethereal oils incredibly well. Sweet and a little bit crossly at the same time they refine a muesli as tasty as a self-preserved jam or the self-baked cakes. Every dessert - whether pudding, yoghurt, curd or ice cream - becomes with this aromatic ingredient a small experience! Some one also nibbles directly just of the glass. . . .